Miele Gallery first of its kind in U.S. This is our most recent general contracting job. 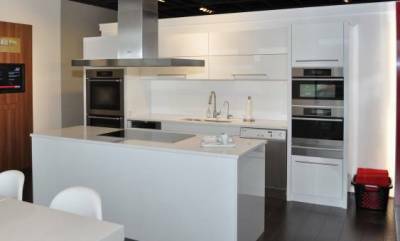 That's the concept behind incorporating a Miele Gallery -- the first in the nation -- in Warners' Stellian Edina showroom, general contracting by Appliance Specialties. 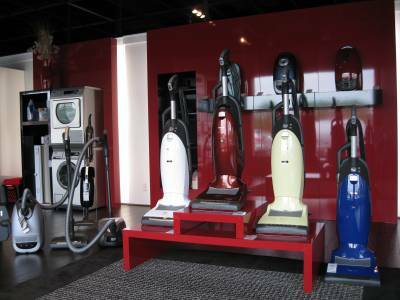 Miele (rhymes with Sheila) is a German manufacturer of high-quality residential appliances and vacuum cleaners that's been available in the U.S. for 25 years now. The Gallery is basically a mini Miele Showroom. Nearly 30 Miele appliances for cooking, cooling and cleaning are displayed in a minimalistic environment free of distraction and clutter. Translation: You can more easily imagine them in your own kitchen. With the launch of the Miele Gallery, Warners Stellian is the only Minnesota retailer of Miele Professional Products. The dishwasher, washer and dryer and rotary iron boast faster wash times and bigger load capacities. How much faster? You can wash a load of glassware while you're entertaining, and it'll be ready in 10 minutes. That's unheard of. The washer and dryer are designed to handle challenges like horse blankets, whose hair would clog up a normal machine.